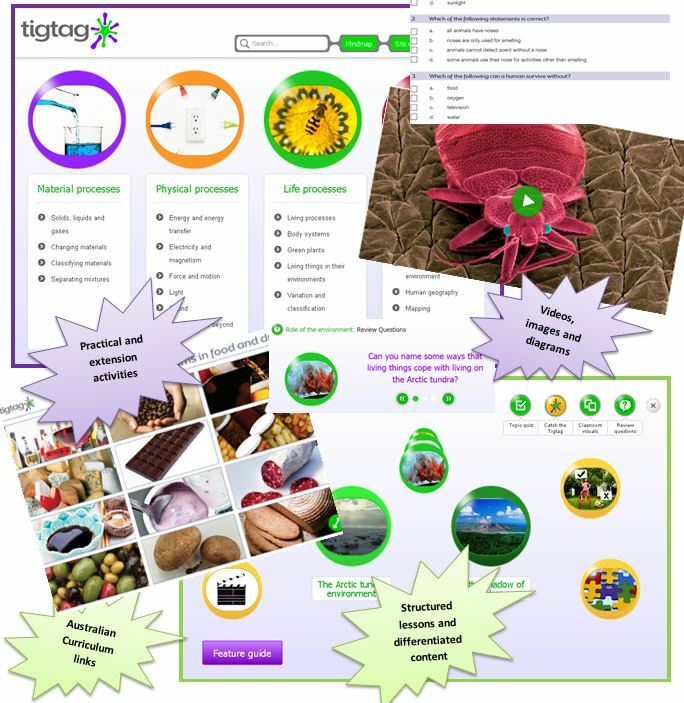 Tigtag is an online resource for teaching primary school science. The database contains: Curriculum films matched to specific curriculum points; Context films that show science in action; Ready-made lesson plans as well as 'build your own' tools; Hundreds of images and diagrams to print out or use on an interactive whiteboard; Clear and targeted topic background information; Practical and extension activities, as well as student worksheets; Topic quizzes and review questions; Fun facts, word jumbles and video clips. The AUSVELS science curriculum promotes six overarching ideas that highlight common approaches to a scientific view of the world and which can be applied to many of the areas of science understanding. These overarching ideas are patterns, order and organisation; form and function; stability and change; systems; scale and measurement; and matter and energy. VELS is no longer the current curriculum in use but for comparative purposes this site provides access to the former Curriculum Standards document outlining Standards for Levels 1 - 6, with the Science knowledge and understanding, and Science at work Dimensions. "Everything about our environment for students & teachers". Prep -Year 10.